'...Close protection is defined as the provision of armed or unarmed specialists to protect a nominated principal from harm' Excerpt from a Standing Committee on Army Organisation by the Director of Military Operations, dated 30 November 1979. 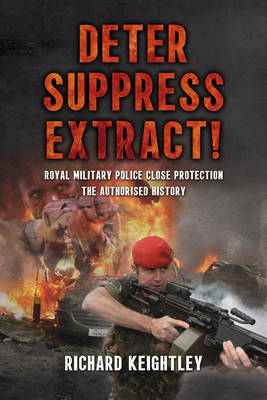 This incredible work has been authored by the former Training Warrant Officer of the Royal Military Police (RMP) Close Protection Unit (CPU), Richard Keightley. Drawing upon extensive material, most of which has never been published before, Keightley chronicles the history of RMP Close Protection from its origins during the Second World War, through to current operations around the globe. It is a fascinating read that is as eye-opening as it is compelling. Although the forerunners of the RMP, as Military Mounted Police, Military Foot Police, Corps of Military Police and latterly the RMP, have always held responsibility for escorting senior commanders in operational theatres, and Her Majesty's Ambassadors and High Commissioners in high risk appointments abroad, it was not until the nineteen eighties that the RMP officially became the lead authority on Close Protection within the British Armed forces. Today, members of the RMP, Royal Marine Police Troop and Royal Air Force Police are deployed all around the world protecting VIPs from harm; be it the drug cartels in South America, Al Qaeda in Africa or the Taliban in Afghanistan. Whether the threat against a VIP is posed by a terrorist or criminal, the level of protection provided by the Military Police remains one of professionalism, dedication and unquestionable loyalty towards the Principal. Keightley's narrative details the discipline of Close Protection and VIP work and in doing so, strips away the mysticism to reveal the intricacies - namely relentless training, attention to detail and a high tempo of operations in the complex world of modern security. From the Northern Ireland experience through to the British Army of the Rhine (BAOR); Joint Operations and the establishment of the Close Protection Unit; training and operations including Bosnia, Iraq and Afghanistan - Keightley's vivid narrative fascinates as it illustrates the vast skill set possessed by the Red Caps of Close Protection. The wherewithal of Walking Drills, Security Advance Parties (SAPs), Residence Security Teams, (RSTs), and 'quick draws' are revealed - as are relationships with agencies such as the SAS, the Police and the Foreign & Commonwealth Office. Some of the operational incidents make for harrowing reading but through Keightley's work, the reader is shown how training and professionalism enabled the Close Protection operatives to survive car bombs, shootings and more. 'By Example We Lead' is the RMP motto and 'Deter, Suppress, Extract!' shows exactly why... Read it and be inspired. There's no one finer than the men and women of the RMP's Close Protection Unit.